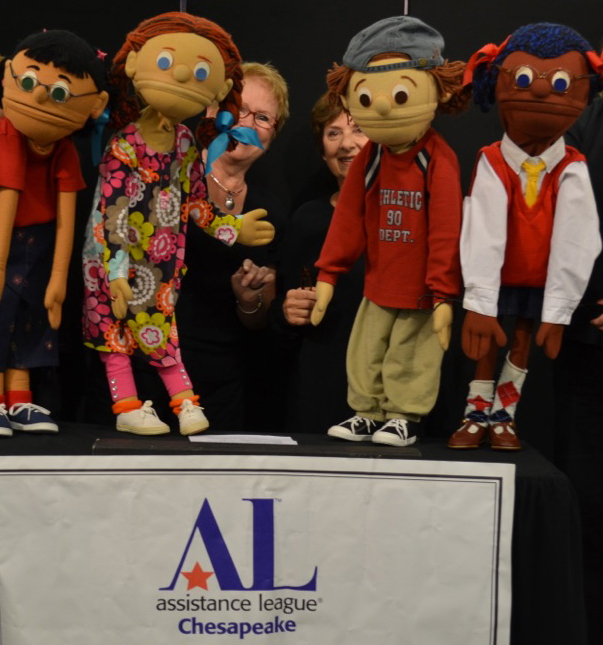 Through the years, over 20,000 area students have gotten to know Eddie, Claire, Jennifer, Brenda, and Melody, who are puppets in our Kids On The Block troupe. With their distinct personalities, they teach children about the importance of using kindness and caring both in and out of school. Through the Kids On The Block program, Assistance League of the Chesapeake has been entertaining second graders in Anne Arundel County for 16 years with this unique series of plays about bullying. Bullying is a national public health issue. It affects those who are bullied, those who bully, and those who witness the bullying. It also affects a child’s mental health and is linked to many negative outcomes including substance abuse and suicide. From October through April our cast and crew visit schools for 45-minute shows, which are presented free of charge. Our members eagerly donate their time and talents for about 13 performances each school year, totaling over 800 volunteer hours. Through carefully scripted material, the puppets portray real-life situations. Eddie is being bullied by a nasty boy in school, but learns to deal with the boy in a positive way, thanks to his friend Claire. Claire is smart, kind, and has wisdom way beyond her age. She counsels Eddie to do positive things when being bullied: tell a teacher, stand by a friend who is being bullied, and work together to raise awareness of the problem. Jennifer is a rough and ready little girl with a learning difference. She can sing, dance, and play soccer. She gets straight A’s in math, but has an issue with reading and writing. Brenda is a little over weight but very sensitive to being bullied about how she looks. Jennifer helps her learn to ignore the bad remarks and like who she is. Melody is a smart and sassy girl who does well in school and offers to help Jennifer with her school work. Our puppet “kids” offer sound advice to the second graders at each school we visit. From our block to theirs, we are rewarded with their smiles as they absorb important life lessons at each performance. 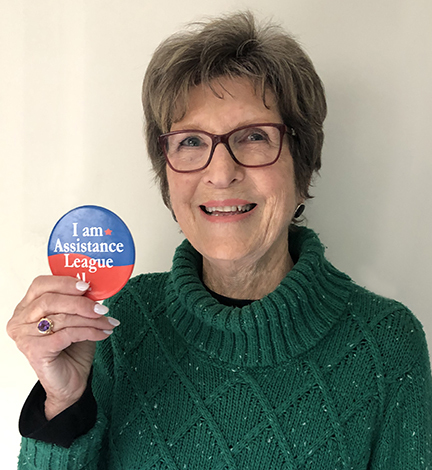 Learn all about Assistance League of the Chesapeake programs. It was a normal weekday in 2003 and I was enjoying my after-breakfast coffee. Having just retired from working with a state senator, I was eager to try something new. As I flipped through our local newspaper, an article on the volunteer page caught my eye. 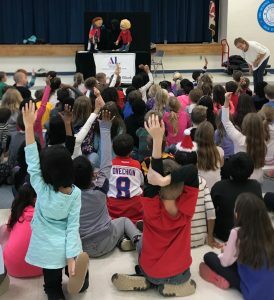 It was a write-up about Assistance League of the Chesapeake and its work at a nearby school. I had taught school in San Diego when my husband was in the Navy and thought it would be fun to work with children again. 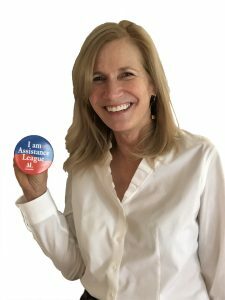 A few days later, I bravely walked into an Assistance League meeting. I was warmly welcomed and discovered that they were going to be volunteering at Georgetown East Elementary School, which was close to my home. I think I may have been one of the first volunteers from our chapter at the school. Since that first meeting with Assistance League of the Chesapeake, I have had many rewarding years. I’ve helped on school field trips, started an after-school knitting group, volunteered as an assistant or reader in almost every grade, and helped with Georgetown East’s holiday shop and spring carnival. Because I loved being a pen pal when I was a child, I wanted to give these kids the same experience. So, for the past 10 years, the children have written to classes in Florida, Texas, California, Virginia, and believe it or not, Nepal. One of the children in Florida wrote that his favorite food was grits. Some of our children had never had them, so I brought in a grits casserole for them to try. I loved the expressions on their faces as they tasted this “exotic” food. I’ve also been active in other chapter programs and events. 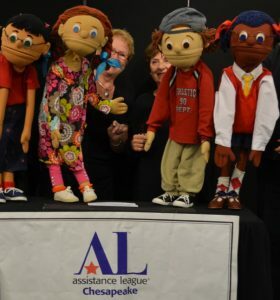 In addition to volunteering at Georgetown East, I’ve enjoyed being a part of Kids On The Block, a puppet troupe that presents shows with an anti-bullying message. 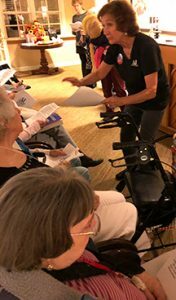 Sing-alongs for seniors is another fun program that gives us and the attendees great joy. Best of all, I’ve enjoyed sharing these activities with the wonderful members of Assistance League of the Chesapeake and I have made real friends in this warm community of volunteers. One notice in the newspaper 16 years ago has made it possible for me to work with hundreds of under-served children in our community and, I truly believe, make a difference. The best part of it is that the rewards flow both ways. Please join me! Click here to go to our membership page. Like many 87-year-old seniors, Bob has lived a full and busy life. He is a resident of an assisted-living facility, and though frail in body, his mind is still active. He has come to look forward to the visits by Assistance League of the Chesapeake members who lead residents in sing-alongs. The first time he attended a sing-along, he was a little hesitant. But as the music started, he found himself sitting up a little straighter, and soon he was recalling the words, rhythms and melodies from songs he learned decades ago, while tapping in time to the music. 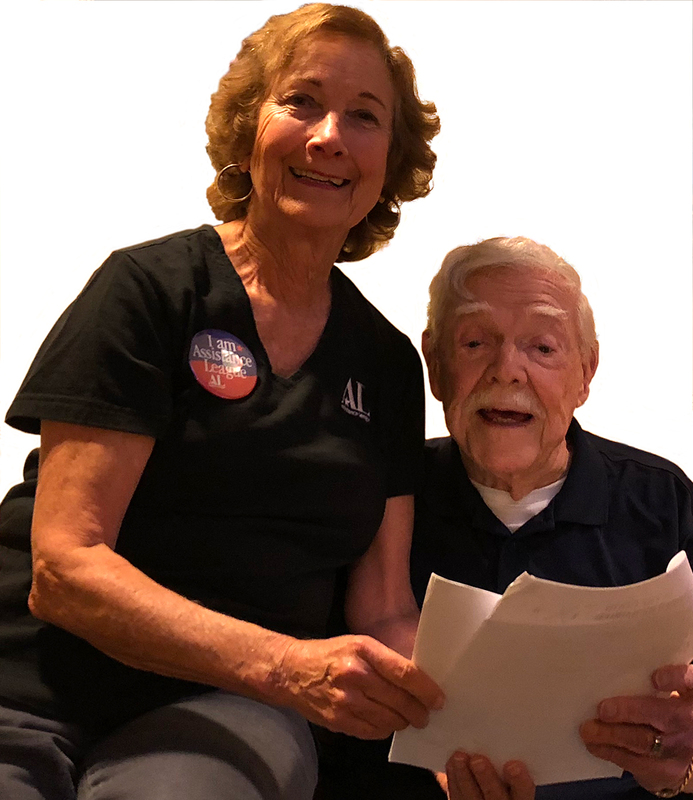 Assistance League members, including Caroline Gilbert shown above with Bob, work the crowd, help residents turn the pages in their song books, play the piano and drums and lead the songs. Some of the residents have diminished cognitive abilities, but once the music starts, they often stand, sing and sway to the music. At one of these events, the gentleman sitting next to Bob showed a special fondness for a song. He was handed a microphone and his rich warm voice filled the room as he led the group in a war-time favorite. Now Bob won’t miss a sing-along. He always leaves feeling buoyed and inspired by the joy of the music and the camaraderie and connection with others. I joined Assistance League of the Chesapeake in 2013 through a friend. I was new to the community, and met Maureen Smith, a long-time member. Upon hearing that I wanted to start volunteering locally, she told me all about the good works our chapter was doing in Anne Arundel County. Her enthusiasm was contagious! I signed up immediately, and have made volunteering in our chapter a priority ever since. 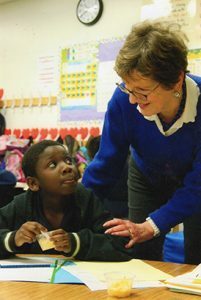 I started by reading with second grade students at Georgetown East Elementary School, then helped with Pen Pals and served on the Board as secretary and membership vice president. Now I am chairman of the Grants Committee. This year, I began working with the Chessie reading program at Meade Heights Elementary School and measuring the kids for their uniforms through our Kids In Need program. I have found enjoyment in every aspect of these activities. I am energized working with the wonderful, giving women who belong to our chapter. The enthusiasm, exchange of ideas, social contacts and the warm and welcoming environment that our members share are a huge part of the experience. I am thankful to be a part of this amazing organization. Alejandra is a student at Germantown Elementary School. Her family of five lives in a one-room structure behind someone else’s home. 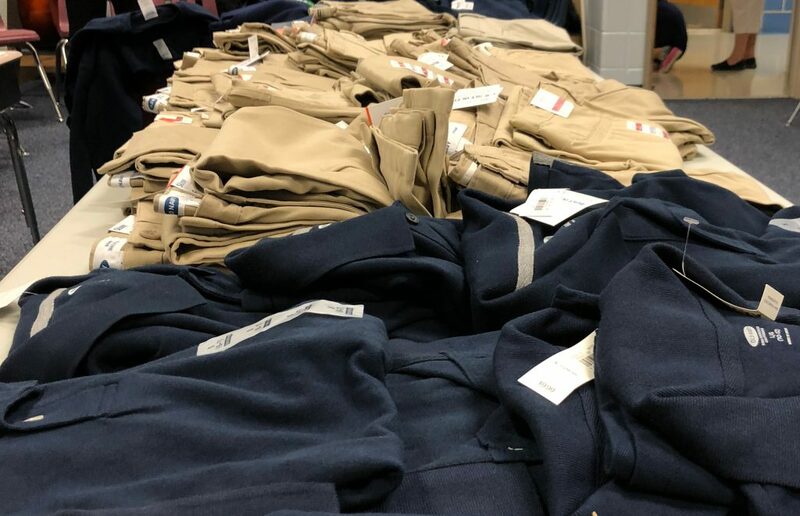 Identified as in-need by the school counselor, Alejandra joined over 2,000 students around Anne Arundel County, Maryland, who this year received polo shirts, sweatshirts, khaki pants, underwear, socks and toiletries from Assistance League of the Chesapeake. On a sunny Friday in September, Assistance League volunteers arrived at Germantown Elementary. Amidst the sounds of children’s laughter and school intercom announcements, volunteers measured the students, carefully allowing for growth. When we asked Alejandra if she knew what size she usually wore, she replied that she had never been to a store to get new clothing and that she had always worn her siblings’ hand-me-downs. “The uniforms help students build confidence,” says the school counselor, Emily Creighton. “The students love their uniforms and are very excited about measuring day.” We are told that the parents of these children really appreciate this gift, which eases part of their financial burden and helps their children do better in school. Each year the hard-working members of Assistance League of the Chesapeake provide new school clothing to many disadvantaged students just like Alejandra. We are proud to be able to give new school uniforms to students at six elementary schools in the Annapolis area. Since 2012, we have provided over 10,000 uniforms to students, but we wish we could provide more! 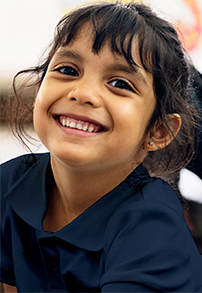 Your donation of $50 will purchase a uniform for a child just like Alejandra. Learn how to help a child in need!